During today’s Walt Disney Company Annual Meeting of Shareholders, Bob Iger revealed that Disney Cruise Line will be expanding their cruise ship fleet with the addition of “two more phenomenal ships”. Meyer Werft in Germany will build Disney Cruise ship #5 which will launch in 2021 and Disney Cruise ship #6 will follow in 2023. 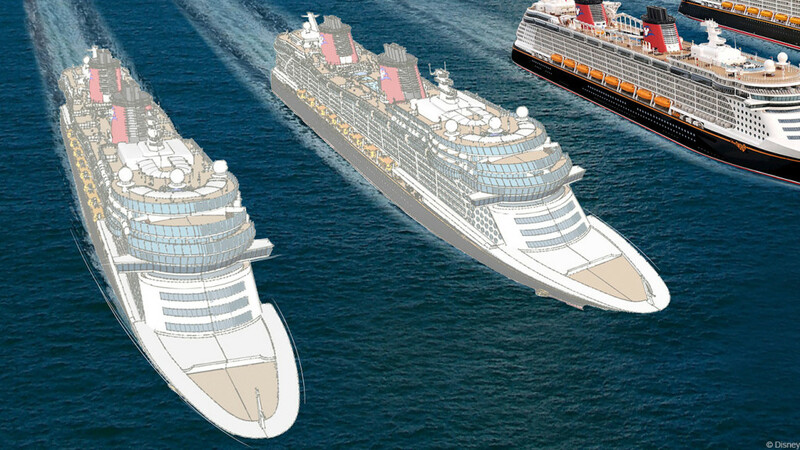 The new ships will have about 1,250 staterooms and will be around 135,000 gross tons, slightly larger than the Disney Dream and Disney Fantasy. 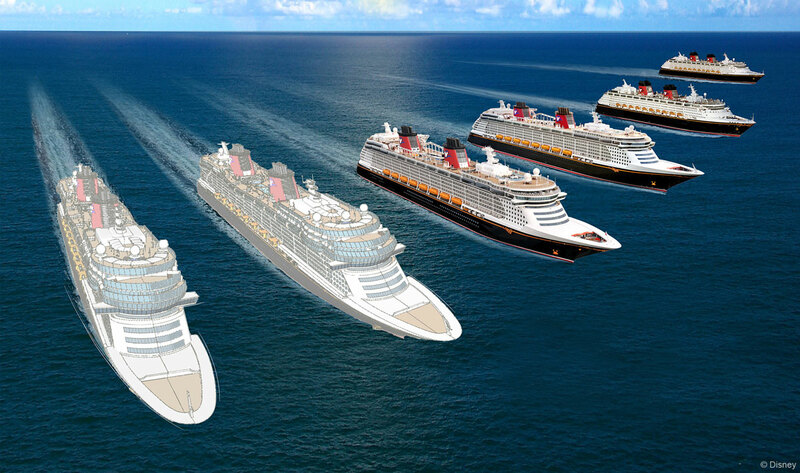 Below is a closer look at the renderings of the newly announced Disney Cruise ships along with the current fleet. At this time, this is all the information that has been made available. Well, other than the rumors that have been ebbing and flowing over the last few years. New pages have been added to the site for Ship #5 and Ship #6. As information becomes available we will pass it along. The internal name for the new builds is Project Triton making the new builds the Triton Class. This entry was posted in News and tagged Disney Cruise Ship 5, Disney Cruise Ship 6, Meyer Werft, Project Triton, Triton Class by Scott Sanders. Bookmark the permalink. Humm, I bet the current price increase are to help pay for the new ships. Let the guessing for names begin! Haha same thing I said upon hearing the news! One should be the Imagination, but I don’t know about the other.. I am so curious as to where the home ports will be and where these new ships will sail! It would be so awesome to get a ship permanently on the west coast. Also, some new and exotic ports would be great! If I remember correctly, they’re contracted to have their newest ships at PC. So if they put anything on the west coast, it’d be the Dream or Fantasy. That was for the Dream and Fantasy only. The contract runs out in 23 I think, and mentions the DReam and Fantasy by name for the first 5 years of the their service life. After that, it reverts to 2 DCL ships with a given amount of sailing. It was a ploy by the port to keep DCL there, and to get the port to pay the lions share of the upgrades. There was some other things there, and until one of the DCL bigwigs called the port president 1 on 1, DCL just about left PC. That is so exciting! I think I read somewhere that the Dream and The Fantasy had contracts with Port Canaveral that they had to sail out of that port for several years, is that true? If so, when is that contract up? I heard it’s a 5 year contract. That’s probably a non-issue. If Disney called up and said “Do you mind if we replace the Disney Dream with the Disney Yoda instead, I’m sure they’d agree. Wow, great news! I wonder if they’ll send these to the Asian market??? From what I understand the Chinese market is beginning to soften a bit. Europe and Australia may be more lucrative. Interesting but not before a few years! My guess for names would be the Disney Wish with Tinkerbell as the atrium statue and the Disney Adventure with Peter Pan as the atrium statue! Both names could be used in clever marketing ads. Disney Imagination and Disney Star ? I like those names! Or maybe Disney Inspiration? Super excited to wee what they come up with. Disney Imagineers definitely have the best imaginations! I thought of those two names and also something along the lines of Disney Imagine or Imagination. Tinkerbell is the Godmother of the Disney Wonder (the only fictional character to be so of any of the four ships), so not sure if they might choose to use her for a statue. However, I can see one more of Mickey’s friends or perhaps another Princess (Belle, Cinderella, Snow White, Elsa, etc.). Or perhaps they use one of the Pixar characters. Whatever they choose, it will be exciting to see the ships built! Blue Fairy/Gepetto and Pinocchio for painting on the name. The Bow Mickey should be Tailor Mickey. Peter Pan could make a stern character for Disney Adventure with Mulan, Hercules, Aladdin in the lobby. Then for the Bow Mickey, him in either a pirate or Jungle Cruise-ish Skipper Costume. Nope, you know it will be something Frozen or Star Wars LOL! After Mid 2016 the Panama Canal Expansion will allow ANY Disney Ship to transit the Panama Canal, so the Dream Fantasy and even the Magic will be able to go to the West Coast and Asian or Australian ports after the new ships come online. So we’ll see! Basing one on the West Coast makes a lot of sense, Disneyland is 30 Miles from the World Cruise Ship Terminal in San Pedro, CA (Los Angeles) so going to DL then on a cruise would make for a very fun vacation for many! Living in Maryland, I’ve seen Carnival and Royal Caribbean have plenty of ships leave from Baltimore. I’m hoping they move the Wonder or Magic to Baltimore and let the newer ships take their spots in the bigger ports. BTW, this extends my goal of cruising on all four ships (been in the Dream taking the Wonder this month)…now I need to take 4 more cruise instead of 2. Life is rough. My guess is that DCL won’t use Baltimore as a home port. Just need one or two cruises a year to be happy. I’m hoping that either the Wonder, Dream or Fantasy could come to Baltimore. That would be much easier for us Marylanders to get on either one without going to Port Canaveral. I like the Fantasy because it has the AquaDuck on it. I think that Captain Fabian (who is currently on the Wonder) should go on the Fantasy. Captain Fabian is currently on the Disney Fantasy. Best guess is that the Wonder will call the West Coast home. Even with the expansion of the Panama Canal it can’t handle ships as large as the Dream or Fantasy. The West Coast is also underserved with limited options for sailings to Mexico and Hawaii. The rest of the fleet will likely remain sailing out of Florida and Galveston with the occasional foray into the Northeast out of New York (the New York cruises for this fall are all sold out). Expanding the fleet was long rumored and this would seem to indicate that DIsney Cruise Line is a net positive for DIsney’s bottom line. The new lock chambers of the Panama Canal are 1400 ft long, 180 ft wide and and 60 ft deep. They are more than large enough to fit the Fantasy and Dream which are 1115 ft in length, 137 ft wide and have an average draft (depth) of 29 ft. Probably would be large enough for the new ships as well. I think the big thing with moving those large ships through the Panama canal would be cost. I’ve been on two Panama Canal cruises on DCL and if I remember correctly the cost to go through the canal with those ships one way was in the 300 to 400 thousand dollar range. Ah, I hadn’t realized that it had been expended by that much. Even so, the Wonder seems like a natural fit since it already spends roughly a third of the year on the West Coast and can sail out of Seattle and Vancouver (mid-sized ships are pretty much the norm for Alaska sailings). I agree that the Wonder doing Alaska in the summer and Hawaii in the winter makes sense. Even thought the new canal could accommodate the larger ships, Tracy Arm can not, and that is a big attraction! My prediction: 2 ships out of Port Canaveral for Bahamian and Carribean cruises, 1 ship alternating between Southern California and Vancouver for Pacific and Alaskan cruises, 1 ship in NY for Canada, Bermuda & Bahamian/Carribean cruises, 1 ship for TX & LA and 1 ship for the Far East. Which ship where? No idea. Sounds like a good plan! I would love a New Orleans embarkation! We did a cruise on the Wonder out of Galveston and it was awesome, but NOLA is closer drive for us 🙂 My daughter would go bananas if DCL went to Asia! Better buy more DVC points! I’m so excited that there are going to be more ships.To the earlier post on Port Canaveral,Disney won’t move from that port cause that’s close to the Disney world and the Dream makes more money than the Fanatsy.Dream sails 2 times a week and Fanatsy 1 time a week. I think they are going to put 1 ship up north like New York or New jesery? They will spread out and there is a long term contract that was reached a few weeks back with port of Miami. I would expect an expansion in European sailings. Disney has been sailing and using several different home ports in Europe. I think they have been testing. Maybe Med in Winter, Baltic/North Sea in Summer? I can’t wait. It will make it seem like the Disney Dream and Disney Fantasy are so old. Did anyone else notice that the Aquaduck is missing on the art for the new ships? I realize it’s just concept art, but it is interesting. Yes I was freaking out don’t kill the aquaduck!! If I remember right, the Dream Class ships never had it in the concept art. It came later. The renderings are very basic. I would not spend too much time analyzing these particular renderings for details. I am putting in my guess for the name of one of the new ships: Disney Enchanted. With the new ships coming in to the fleet in 2021 and 2023, It will be time to retire the magic and wonder. Once the first of the new ships enters the fleet, the magic will be 24 years old. Cruise ships are designed to be in service for a minimum of 50 years. Majesty of the Seas has been in service for Royal Caribbean since 1992 and the Carnival Fantasy has been in service for Carnival since 1990. At 24 years the Magic would still have a lot of years left in her for Disney Cruise Line and her overall design has ensured a cruising experience on par with anything else sailing today. My favorite comment so far was the ship getting named the Disney Yoda. That made me laugh. I’m picturing an all green ship. That would really align with the classy understated tones that they have had so far. Maybe the other one could be the Disney Jar-Jar Binks. Or maybe a gold ship and call it the Disney C3PO. I wonder if they’ll go West Coast and use Disneyland as their marketable port like DisneyWorld is to Port Canaveral…. Although, there’s obviously no Disney Private Island on the West Coast. Hmmm…. Yes… there is!!! It’s called Aulani! LOL! It is very unlikely that they will retire either the Magic or the Wonder. They won’t be that old by ship standards and thanks to their vigilant maintenance and constant updating they remain pretty fresh and attractive. And like Scott said, those renderings are just that, there is no way we’ll be able to discern ship features from them. Disney Marvel. Make it a helicarrier and you’d have to blast me out of there with a fire hose! I think they should name the 2 new ships, Wishes and the other Believe 2 new ships Wow that is great. Can not wait to book the first cruise on the 2021 ship. Looking at the little bit of specs that DCL is providing, the new ships almost seem like an improved Dream class. Same number of rooms, the only real difference is in weight. When I talked with Capt Henry about the shape of the Dream class, he explained that the shape comes from the way DCL worded their contract. They wanted a ship at 129000 tons, So long by so big with 1250 rooms. So the shape was dictated by contractual obligations. Now, assuming that the other dimensions stay the same, it seems to reason that the new ship, may not have that floating I beam look to them. They may look more along the lines of the classics. I hope your right. I’d love for them to look for like the Classics!!!! My guess is on the Disney Wish and Disney Imagination. I also think Disney is being very smart on the time frame of the 2 ships, because it gives the company time to tell just how popular the Chinese market really is. Assuming the new ships will sail out of PP…I see one ship probably the Disney Wonder Sailing out of Asia and the US west coast. The Disney Dream heads to Miami and Disney Fantasy Alternating between New York and Europe. And the Disney Magic sailing year round out of Galveston Tx. I think you will find the Wonder will do Alaska and Hawaii as is the case. A larger ship (either the Dream or Fantasy) will be permanently positioned in Europe with the other doing departures from various ports (NY, Texas, Miami, etc) – perhaps even ‘home porting’ on the West Coast for the summer. The Magic doing longer, more specialised itineraries (Australia, Asia etc.) . The new ships will do the Orlando departures – new ships = new product = extract more money from previous cruisers. The Fantasy and Dream cannot fit under the Bridge of the Americas they are too tall! Yes they can. The Oasis Class and there maybe 2 or 3 other classes that won’t make it but the Dream class definitely will. I wouldn’t put too much stock into what the crew is saying about the names and whats going into or not going into the ships. I would agree that Wishes and Imagination are possible names, the people in the know would be Commodore Tom, whoever the Chief Engineer is over all of the engineers, and 200 Celebration Place. They would have direct hands on with the design of the new ships, and everything else in it. I learned a long time ago to take any crew rumors with a grain of salt. I’ve even heard cases where rumors were made up just to see how far they would reach on the message boards. I try to keep things on the site grounded with some tangible source to collaborate the story. Obviously, this is not always possible, but plans can and often change leaving once true rumors purely fantasy. I know this announcement came out a long time ago, but it’s still so exciting! Taking an inaugural cruise would be a dream come true. If I’m a Gold Castaway Club member, do you think I’d stand a pretty good chance of being able to get on the first sailing? Just curious if you had any insider knowledge you could share! I booked the Fantasy’s several months after it came up for booking as a gold. There was still availibilty several months later. Maybe up to 6-8 months before the sailing. You should have no priblem. I would plan on booking though as as son as they open up the bookings so you get the best price. If they follow true to past Maidens, the deposit is non refundable. I found this earlier, while looking for something else. I’m guessing that might answer the name question. But, it is a bit dated, being from 2014.